Longevity is a rare bird in the fast moving and fickle world of perfume. Out of the 1200+ fragrance launches each year only a small contingent will be successful in keeping their shelf space for a considerable number of years. The reality is that creating a perfume that is successful and outlasts its peers is difficult but creating an icon is much something altogether much trickier. There are perhaps a handful of perfumes that could be considered as being ‘iconic’ – Chanel’s No 5, Guerlain’s Shalimar and Thierry Mugler’s Angel instantly spring to mind – each one has changed the face of perfumery and serves as a reminder that being divisive and not pleasing everybody is a ticket to success – it pays to be different. Jean Paul Gaultier Classique, a perfume featured in last week’s his ‘n’ hers article, is a fragrance that ticks all of the right boxes – it’s an icon, it’s not safe or for everybody and it certainly has longevity, both in terms of its physical odour presence and how it has outlasted the competition. 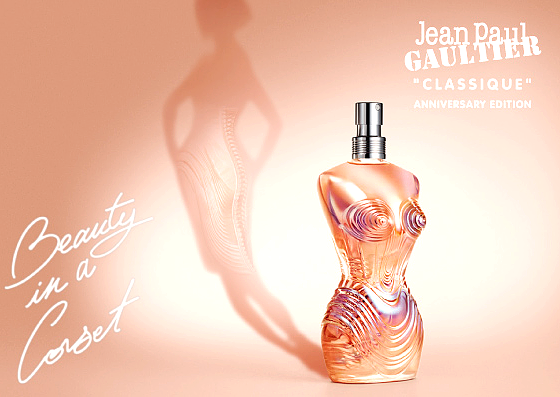 Released in 1993 simply as “Jean Paul Gaultier” Classique is a gutsy and unabashedly feminine floral oriental with delicious notes of rose, orange blossom, face powder and vanilla. It is a perfume that has the ability to give off vibes of beautiful sensuality and intense eroticism all at once, almost as if the woman imagined by Gaultier and perfumer Jacques Cavallier (also responsible for YSL’s Cinéma & Elle, L’Eau d’Issey and Stella) could switch from couture-clad classic movie star to corset-wielding bedroom mix at any second. Packaging has always played an important part of Classique’s appeal and Gaultier certainly caused a stir with this feminine torso, taking inspiration from Schiaparelli’s iconic fragrance Shocking, dressed in the finest corset and housed within, of all things, a tin can. So it is with no surprise that as the house celebrates the 20th year of Classique they do so with a display of 20 corsets. Over the years Classique has been redressed in a number of fashions, many of which took cues from Gaultier’s collections at the time. Whether it’s the “oversized breasts” of 2005’s Bien Roulé corset giving a nod to the Barbès collection of Autumn-Winter 1984-1985 or the festive red Christmas edition, each of Classique’s guises are filled with the romanticism meets enfant terrible humour that makes it all so ‘Gaultier’. This perfume lover personally has a soft spot for the Madonna-inspired ‘Rockstar’ edition, which showcases a fierce degree of Blond Ambition with its gold, pointy bra and corset. It’s a nod to a trio of icons; Classique, the Material Girl and the conical bust – it’s almost too much fabulousness to handle. In addition to the celebration of corsets Gaultier has launched a striking Classique 20th Anniversary Eau de Toilette entitled ‘Belle en Corset’. The scent remains the same, however the bottle appears as a beautiful, almost pearlescent form adorned with a futuristic yet unmistakeably classic corset etched directly on to the glass, accenting the feminine curves and lines that makes Classique the icon it undoubtedly is. The Classique 20th Anniversary Belle en Corset is available in 100ml Eau de Toilette for £60.35 – a small price to pay for a piece of perfumed history. This entry was posted on Wednesday, May 8th, 2013 at 10:04 am and is filed under Candy Perfume Boy, Fragrance, Guest bloggers. You can follow any responses to this entry through the RSS 2.0 feed. You can skip to the end and leave a response. Pinging is currently not allowed.